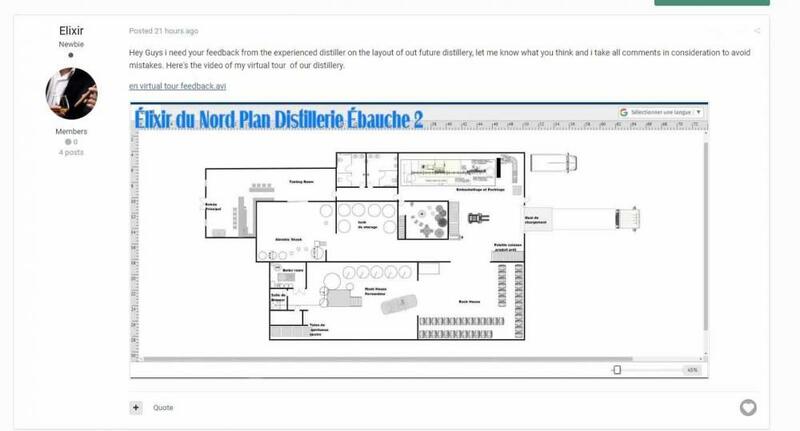 Hey Guys i need your feedback from the experienced distiller on the layout of out future distillery, let me know what you think and i take all comments in consideration to avoid mistakes. Here's the video of my virtual tour of our distillery. Your link does not work and your .jpg can't be viewed. The attachment is a video file, not a .jpg. I was able to download it and play the video on my computer. There are just so many variables its kind of hard to give feedback. Here is what I remember thinking from watching most of the video yesterday.. The bottling line area is very far away from the production/storage area; with a number of walls in the way. You will have to end up running hoses all the way around the office/courtyard area from the storage tank area. What I think is the brewing/fermenting area is also separated from the distilling area, so again much longer hoses, or you have a hole in the wall for them to run through? Basically I dont see the need to separate brewing/fermenting/distilling operations into distinct spaces with walls in between. Having a walled off area for bottling might make sense, but then it should be directly next to the tank storage area. Change the layout of the rack house so all the barrels are able to be oriented in the same direction. Dont have a hallway to the brewing area going through the rack-house that effectively turns half your rack-house space into a hallway. No idea what your business model is, but if it includes a tasting room then you probably should make the tasting room much larger. 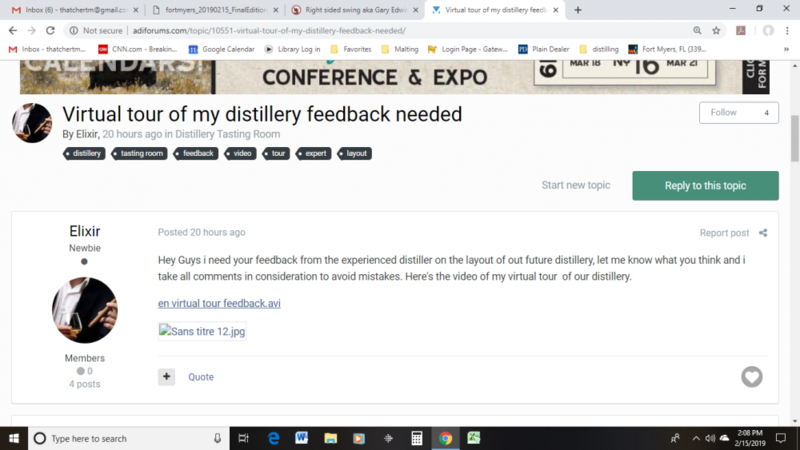 If you are only doing samples of product its probably fine, but if you are thinking you are going to be open evenings and weekends and serve cocktails, and try to use it as a bar, then make it bigger. More seats, more dedicated storage for the bar and merchandise, a backroom for preparation of syrups, mixers, garnished etc. Also - Where is the storage area for pallets of empty bottles and, pallets of bottled product? I dont know what the total square footage of this layout out is, but it seems to be planned for an operation similar in size to my own, and at any one time we might have 10 pallets of empty bottles, 15 pallets of filled bottles and 6 pallets of grain. When I try to download it says the item cannot be located. The attachment is a video file, not a .jpg. Non-working video link and broken .jpg above. Does it work if I upload them... ?